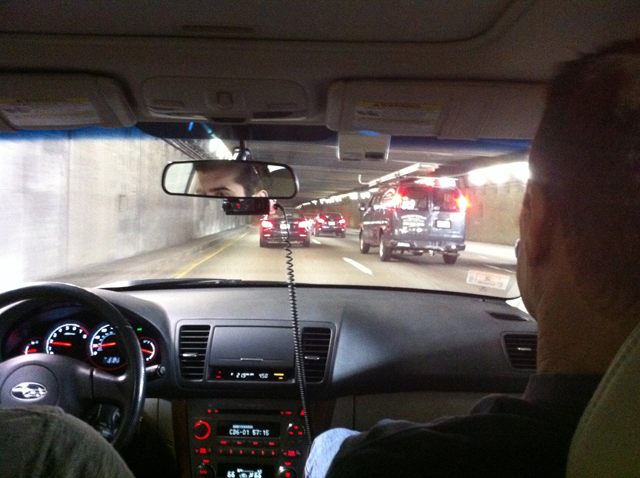 First off a big thanks to Tony “BigTDogg (MA)” for setting it all up and getting us to Boston back in May. 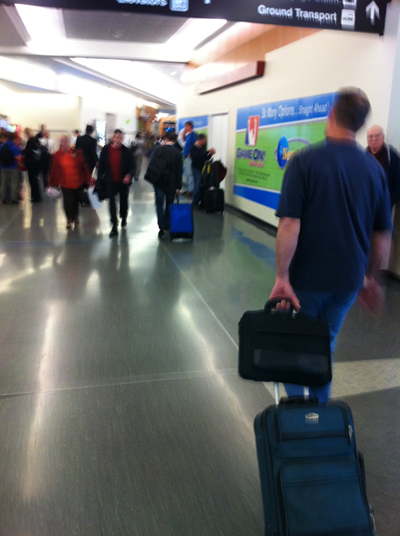 We started Friday morning by heading out to LAX around 4:30 a.m. From there we get to our connecting flight in Salt Lake City to get us to Boston late afternoon\early evening. 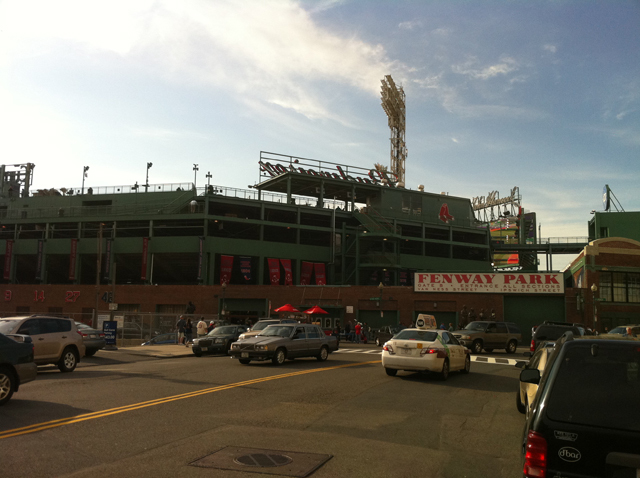 Just in time to catch a game at Fenway Park to see the Red Sox play! Sadly though we didn’t get a chance to see the game but it was great to see the ball park in person. Going to the east coast gave us a great opportunity to see how good 93 octane fuel is. We had experience with Canadian 94 octane in the past. 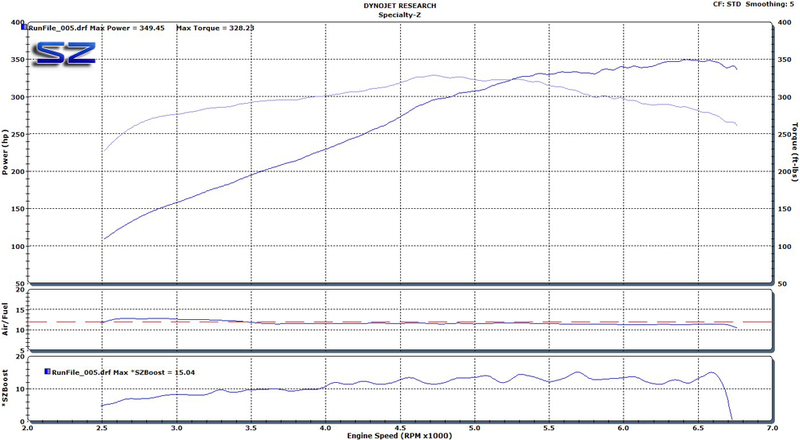 We found that the 93 octane fuel was definitley better than our CA 91, but many of the guys in Boston had been running advanced mechanical timing (past 15 degrees on the CAS) and had very lean\advanced ECU tunes to start off. Many of them had been detonating like this for a long time which can cause (caused) hot spots on the tops of the pistons. This makes it easier for the engine to detonate under conditions it normally wouldn’t. In Tony’s DD vehicle fighting some of the Friday afternoon traffic. 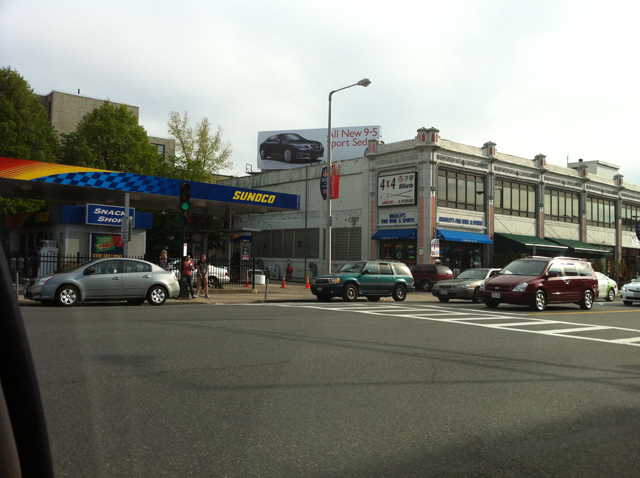 Sunoco gas station. We can only dream……. The game was just about to start too! Our view from the hotel room. Thanks again to Tony! 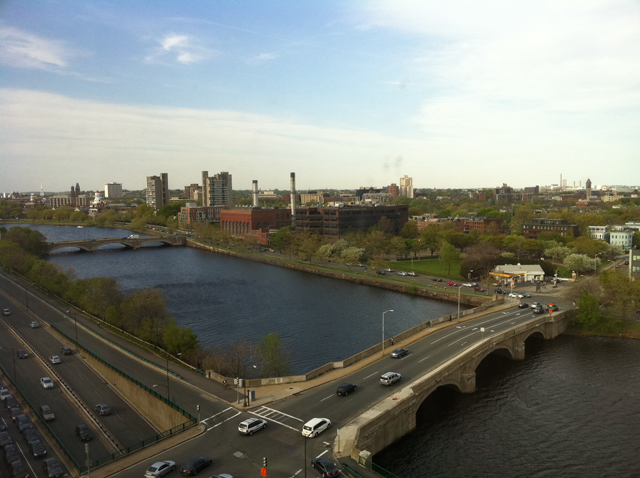 Beautiful view of the Charles River. 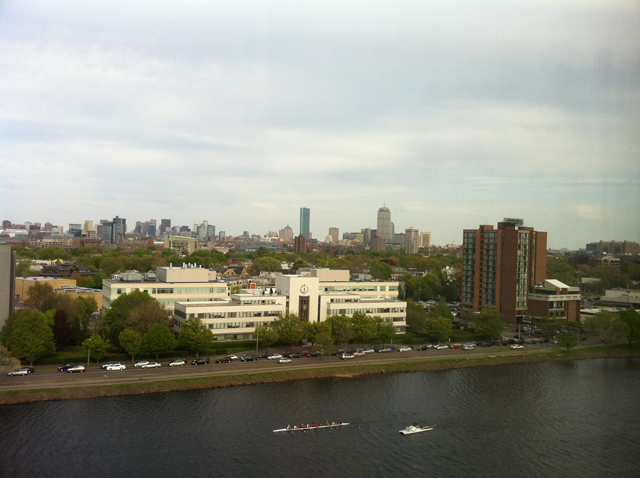 To the left we had a view of Harvard University. I can keep boring those of you with what we ate or when we used the bathroom but I’ll advance to the nitty gritty. The following morning we woke up bright and early to meet Tony and Carlos at the entrance of the hotel. From there we headed to NEDyno which is about 45 minutes from the hotel. Carlos’s Z is beautiful and one can eat off of the entire car. 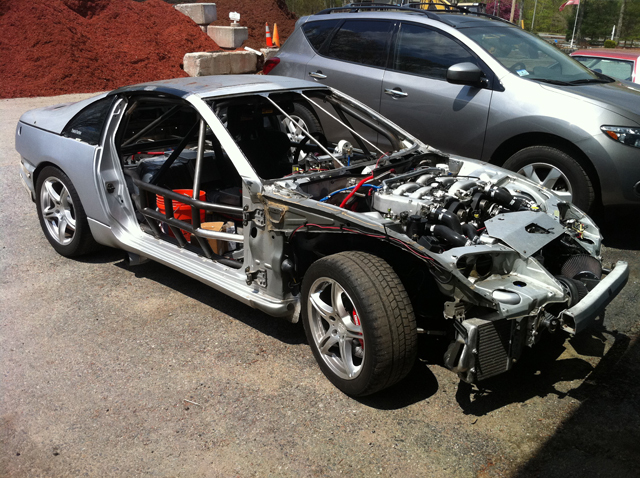 The under-body is spotless and his attention to detail is most impressive (golf clap). 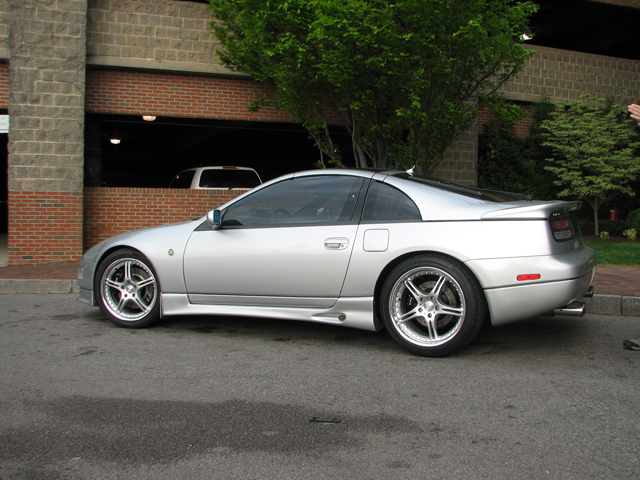 The one thing that would make it look better is yanking that (ugly) Borla Catback. Pretty under the bonnet as well. NEDyno our place of worship for the next two days. John the owner of NEDyno is an extremely nice and knowledgeable guy. Thanks again for letting us use your facilities and setting off your CO alarm a million times. Up first was Carlos in his stock turbo’ed beauty. 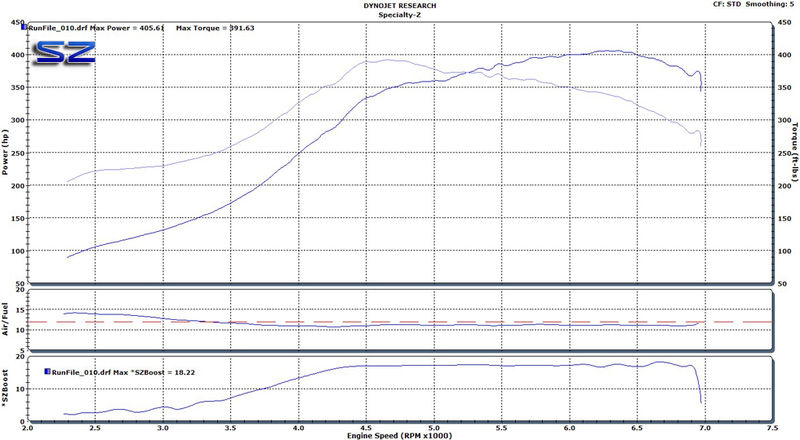 Carlos had our 2.5″ DPs and TPs that lead to that Borla Catback I mentioned earlier. Along with some other “minor” bolt ons. Mod list. Up next was TJ. Mod List. 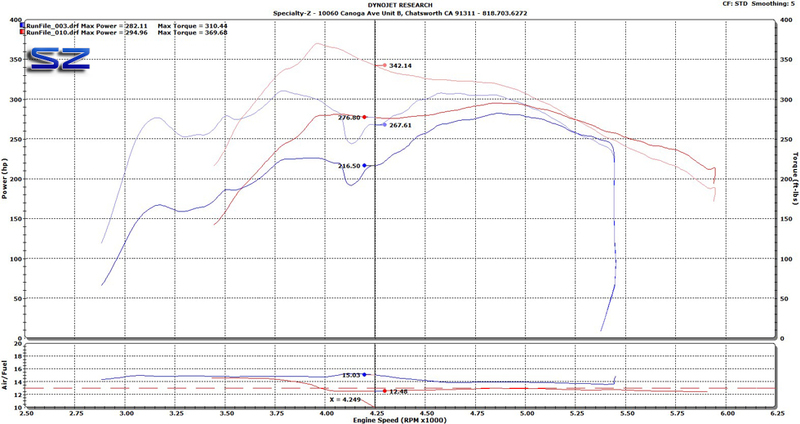 Here’s TJ’s tune on meth using Snow Performance Boost Juice. TJ found out just how much pressure it takes to pop his weak link methanol lines off! Jeff’s 93 Tune. Mod List. Jeff on Q16. The addition of some larger intercooler piping would definitely help him. 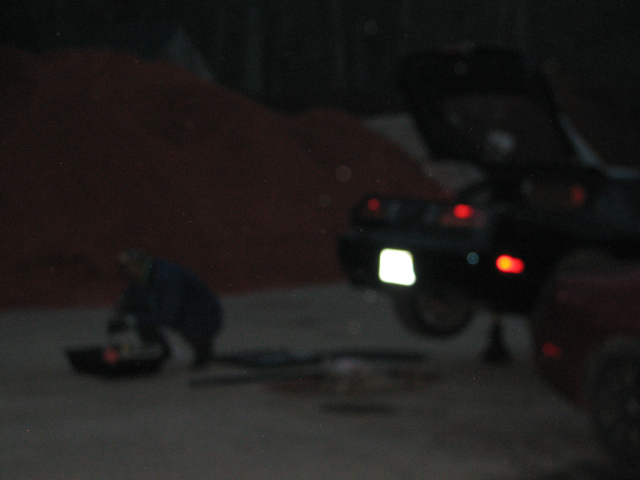 Silas found out the hard way that with even twin pumps a dirty fuel tank WILL cause fuel pressure drop. I apologize for the terrible picture. Silas’ 93 tune after the tank and pump socks were cleaned out. Mod list. 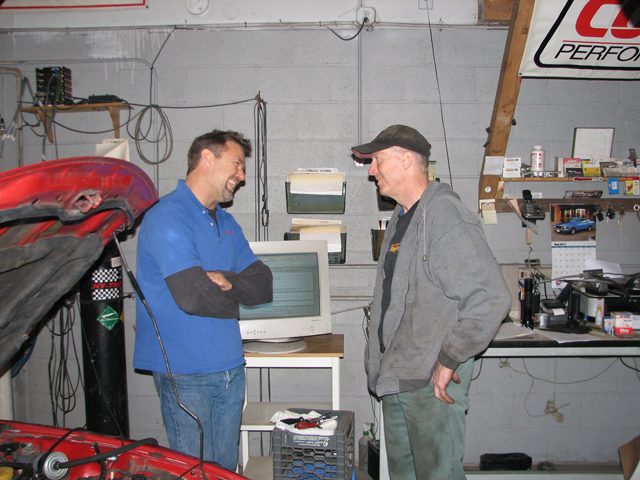 The following day Mr. Doug brought by his race Z32 and his brother’s beautiful road race ready Daytona. 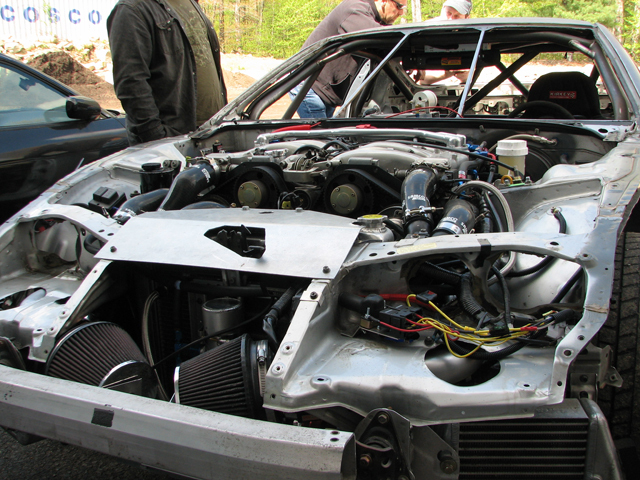 In all its glory is Doug’s race Z32. It would be interesting to see how light this thing weighs. 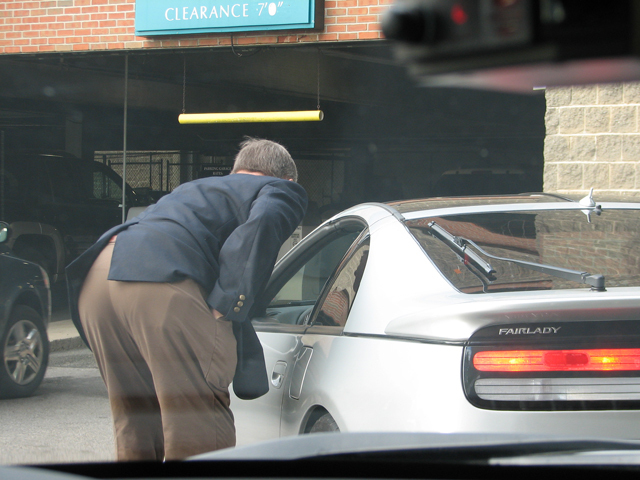 That is a side exit exhaust you see in front of the rear tire. 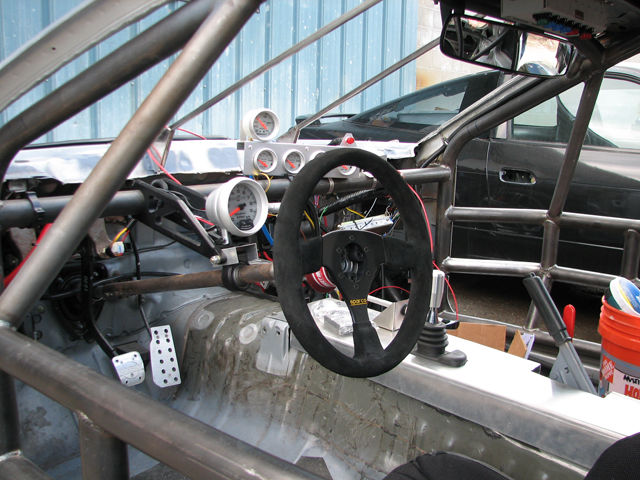 Still on stock I\C piping with custom turbo inlet piping. A\C and Radio users need not apply here. The elaborate fuel surge tank. Doug’s 93 Road Race Tune. Very conservatively tuned for the rigors of road racing. 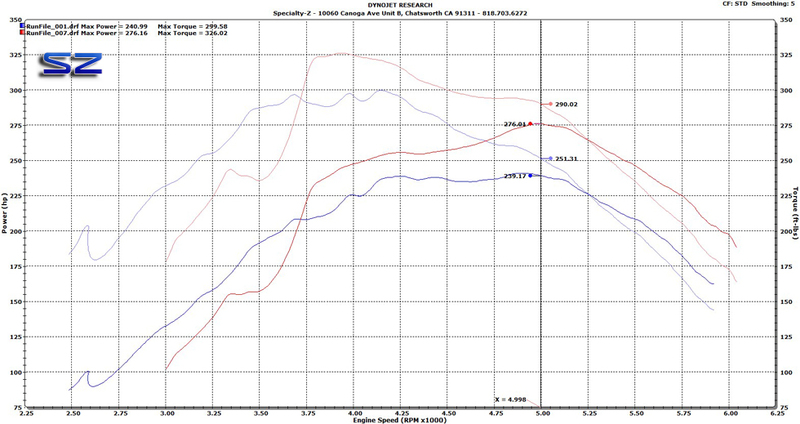 Doug runs JWT Sport 700s with our 3″ Down Pipes. After the down pipes its all custom exiting out the side. 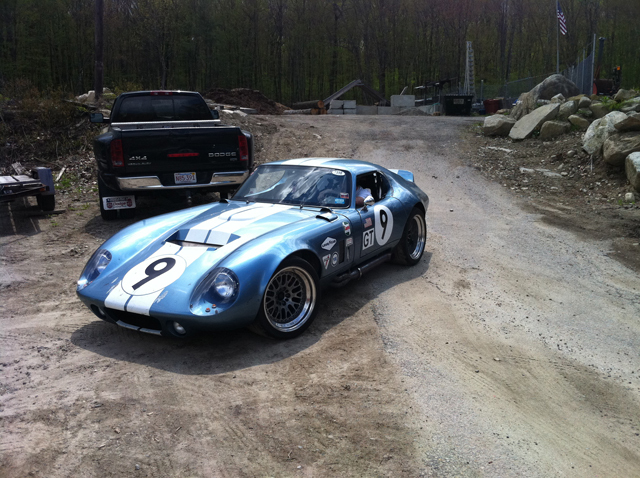 Doug’s 100 Octane Road Race Tune. Again a very conservative tune. 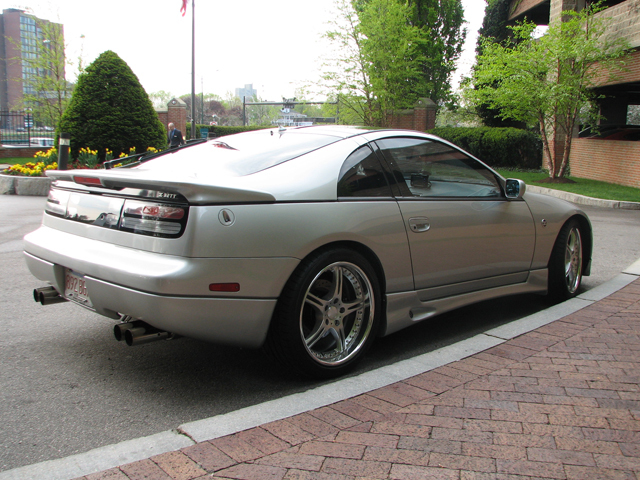 Steve’s 93 Tune. Mod List. Sako’s 93 Tune. 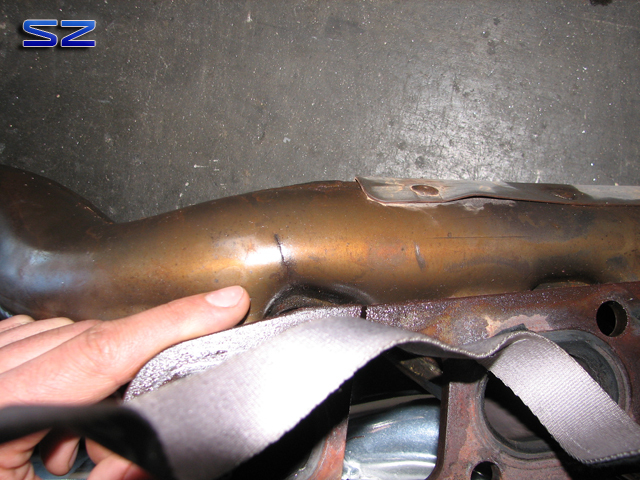 When inspecting Sako’s Z, we found that his intake manifold gasket was cracked and leaking. 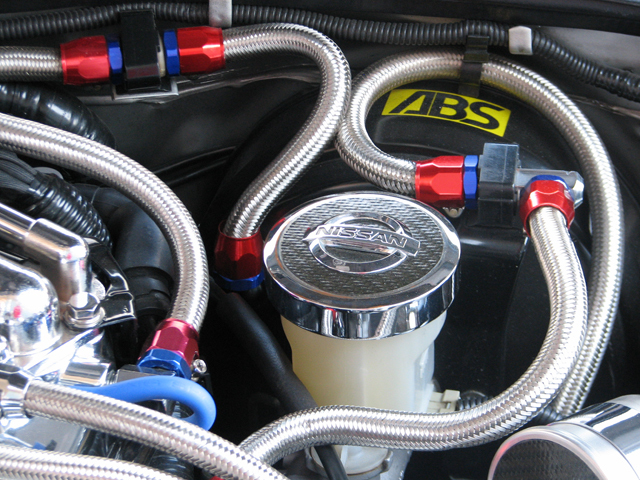 Sako and his brother pulled the manifold in no time and used silicone as a gasket instead. Sako was only running boost jets as his method for boost control. Mod list. Tony’s VG. Greg performing a kung fu move on it. Tony’s 93 Tune. 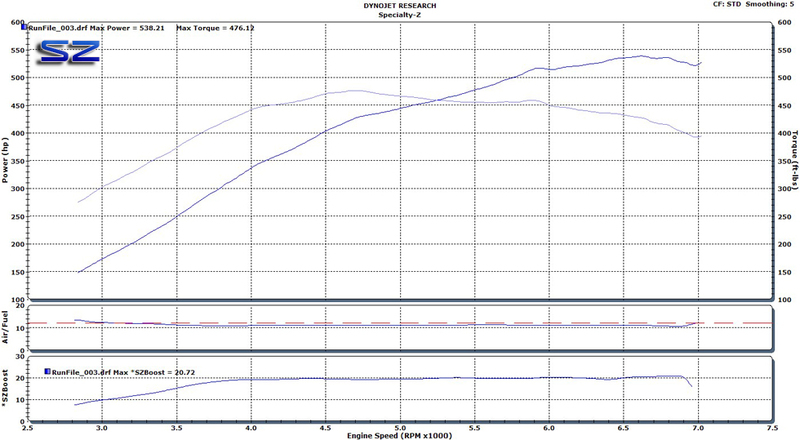 Tony’s Z was abnormally pinging at low boost. Fuel pressures were good and everything checked out mechanically. Turns out Tony had put in some Redline Fuel System Cleaner in the tank. We drained the tank out and filled it up with a fresh tank of 93 octane and pinging problems went away. A word to the wise, do not drive hard on gas with fuel system cleaners. Mod list. Here’s Tony on meth. The red run is the tuned run. I put the blue run which is running meth UN-tuned. 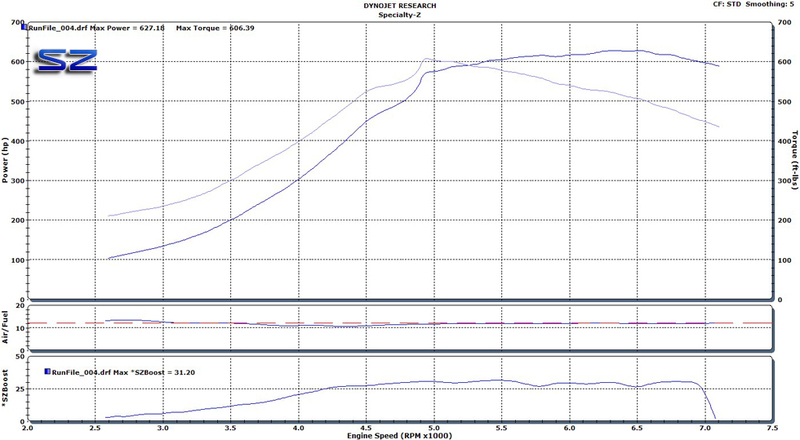 You can see that just slapping on meth injection and not tuning it properly will only get you mediocre results and in most cases cost you power over not even running it. 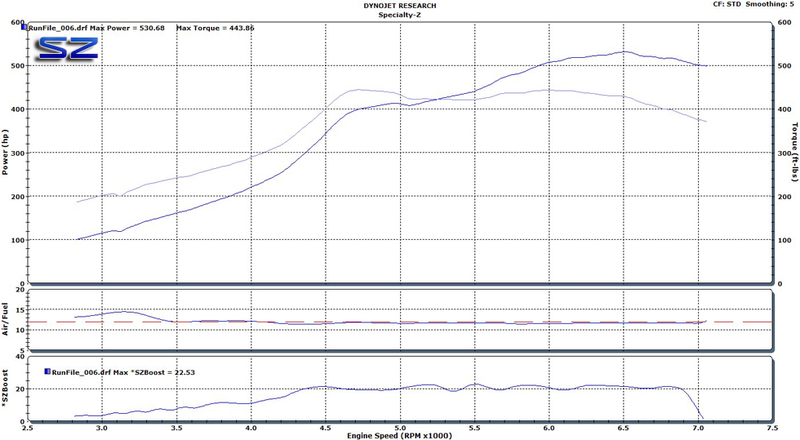 Notice that between 5500 and 6500 RPMs the boost level is the same yet it is still making a ton more power safely. Remember to use a high quality methanol. There’s a reason why windshield wiper is cheap; its meant to clean your windshield. In no particular order a huge thanks to Tony (and his wife), Carlos, John, Doug (say hello to your dad for us), Jeff, TJ, Steve, Sako (tell your bro hello), Silas, and Keefe. 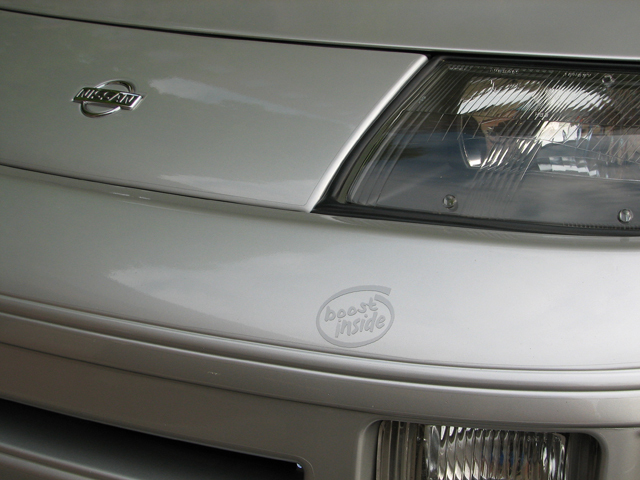 This one’s from awhile back but it shows some nice gains on a “bolt on” VQ35DE. 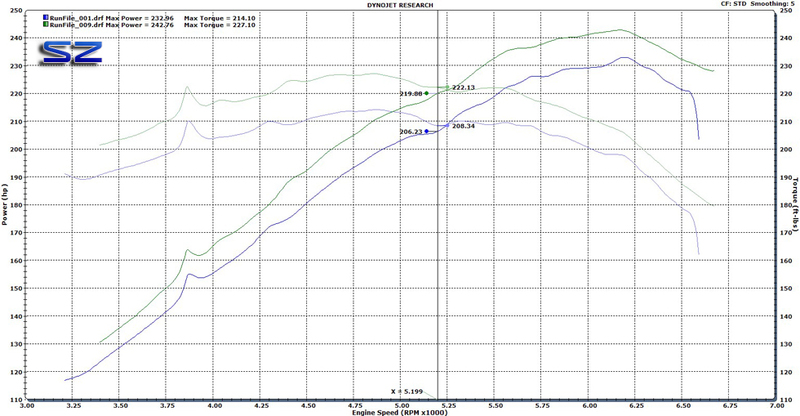 Blue was the baseline run (before) and green is tuned (after). 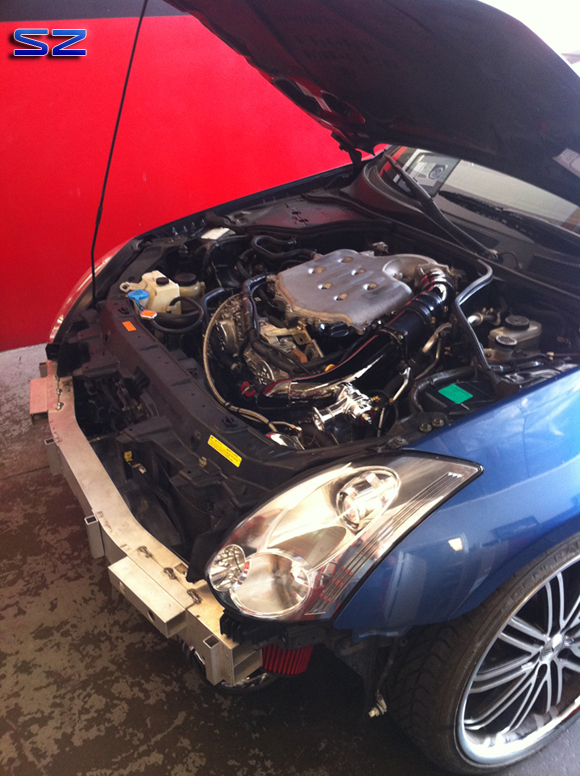 Edin’s G35 came to us with many issues left by another shop. The car was in no shape to be driven down the street when we got it. 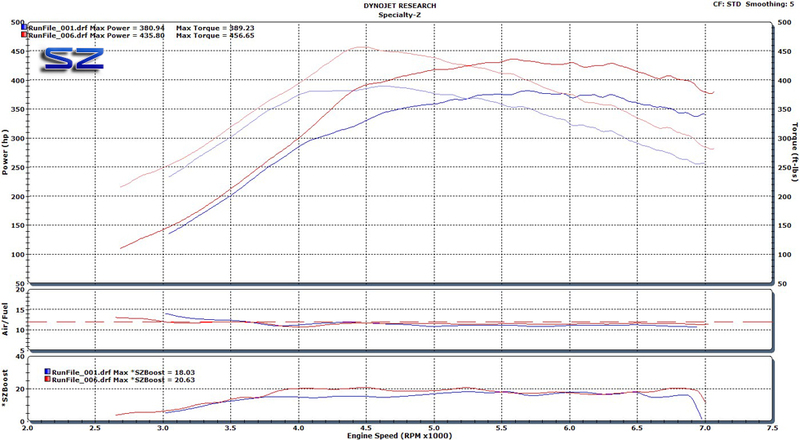 The Turbonetics single turbo kit (now Treadstone) was missing many parts and had lots wrong done to it. Thankfully all is fixed now and Edin now only has to upgrade his exhaust system to maximize his setup and make more power. With an upgrade to the exhaust (currently all it has is a single 2.5″ outlet! ), Edin should easily see a 30+ whp gain. Before these bad boys make into the hands of customers they’ll need some machining. A big thanks to Mike Smith for his hard work and dedication. You are truly an inspiration for us. It is an honor to be your friend. Brian and Jason both brought in their Titan trucks for a header install and tuning. One problem that plagues all Titans is the factory exhaust manifold cracks. 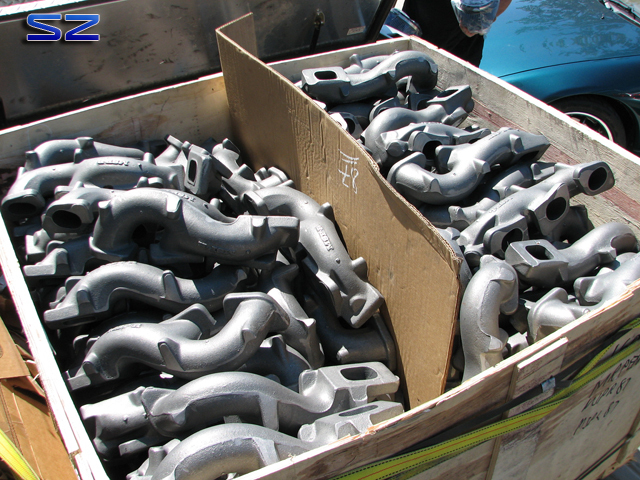 Since the manifold and cat pipe are all one piece there ends up being a tremendous amount of stress on the manifold due to in part by the weight on the manifold and thermal expansion. 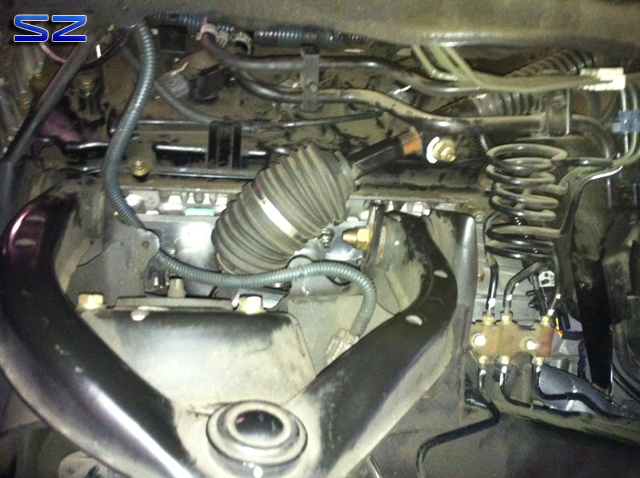 Up first is Brian who brought in a set of Stillen Headers for his Titan. Somewhere in that picture is the Stillen Header. 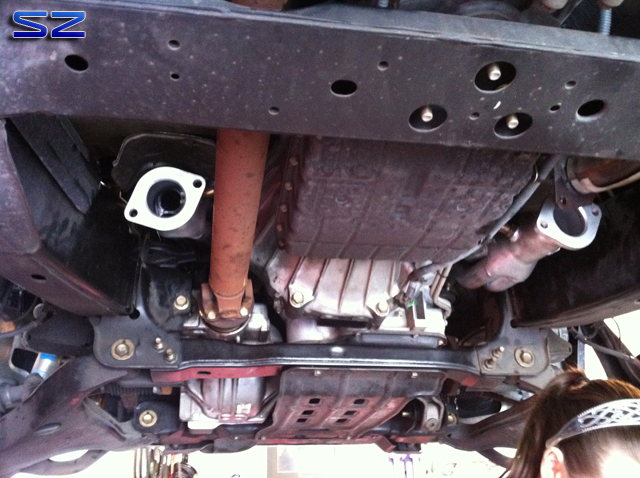 Pic from below of both headers installed. What a joy installing headers on a 4wd truck. Dynoing the Titan is a tad tricky due to the AT transmission. It wants to downshift as soon as one goes WOT. 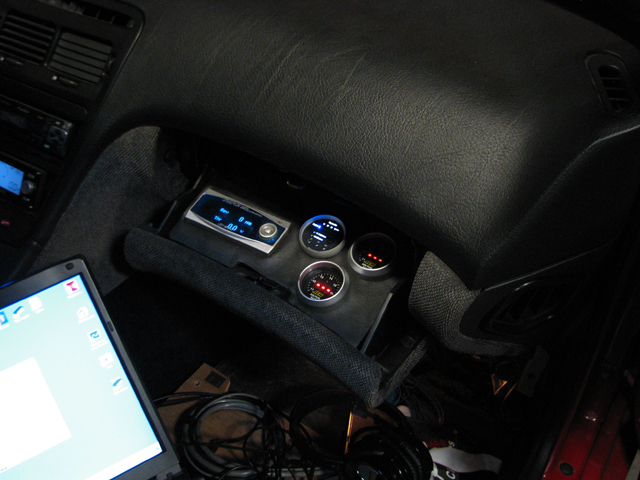 I had to start above 3800 RPMs. Blue run was after we installed ONLY the headers. No baseline before hand unfortunately. Red run was after we tuned the Titan for some excellent gains. To fully appreciate the headers a tune is a must on these engines\trucks. You can see the AFR on the blue run was bad. Although peak WHP wasn’t crazy the gains throughout the band were huge. 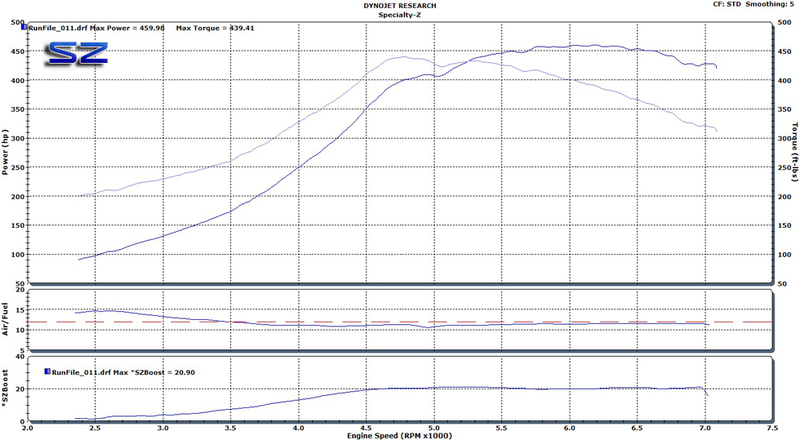 Peak torque shot up over 59 wheel torque. You can clearly see the the cursor at 4250 showing some sweet gains. Almost 80 wheel torque gained and 60 whp! Not bad for only headers and tune. I took a picture of what came off of Jason’s Titan’s manifold. You can easily see the crack. By law or mandate, Nissan and other car manufacturers are responsible for replacing this part since it deals with the cats (emissions components). Sadly though, the dealer will try to pass it off since its a hard job to do (replace manifold) and hard to see it while on the vehicle. 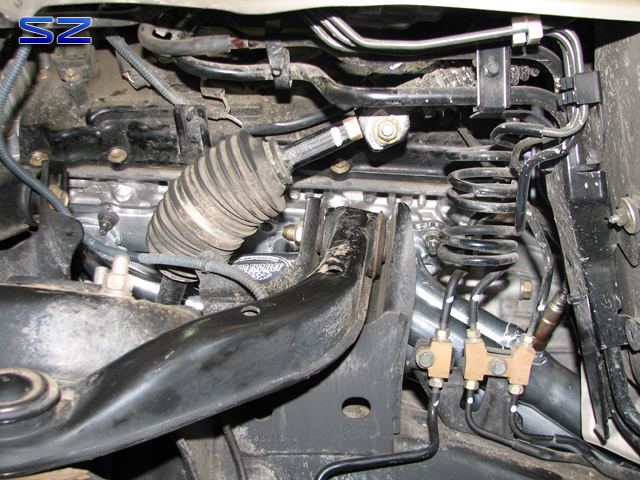 Here you can see how the factory tied the factory manifold (TOP) in with the main cat. One reason they do this is to get the cat hot quicker and keep the cat hotter for cleaner emissions. This however does not help manifold longevity. 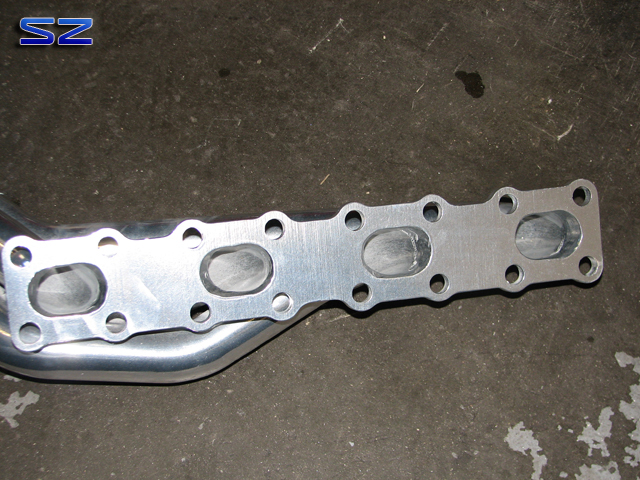 The new shiny ceramic coated header is from Doug Thorley. These headers from D.T. had cleaner ports than the Stillen pieces. Where’s Doug? If you take a close look you can see the D.T. 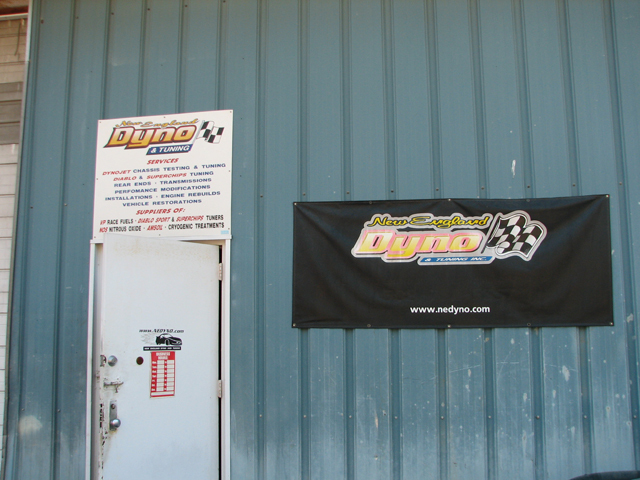 plaque on the header. Another nice thing about the D.T. 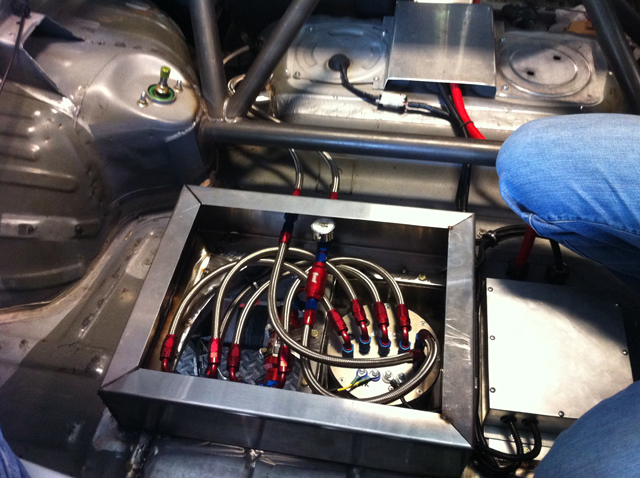 headers was NOT having to extend the O2 sensor wiring like we had to do on the Stillen units. 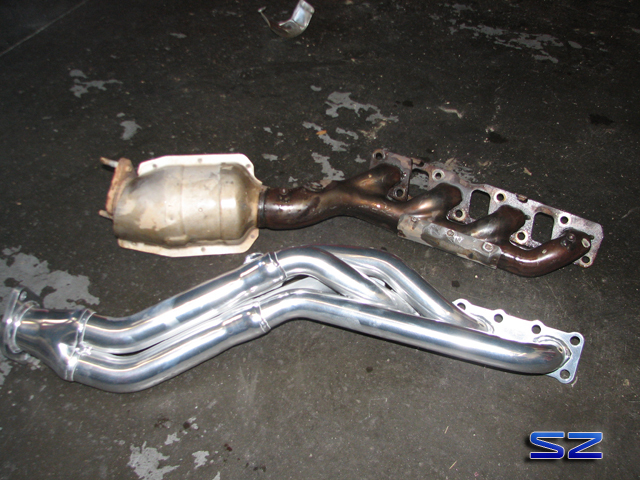 We also installed a set of Berk’s HFC B-Pipes for even less exhaust restriction. 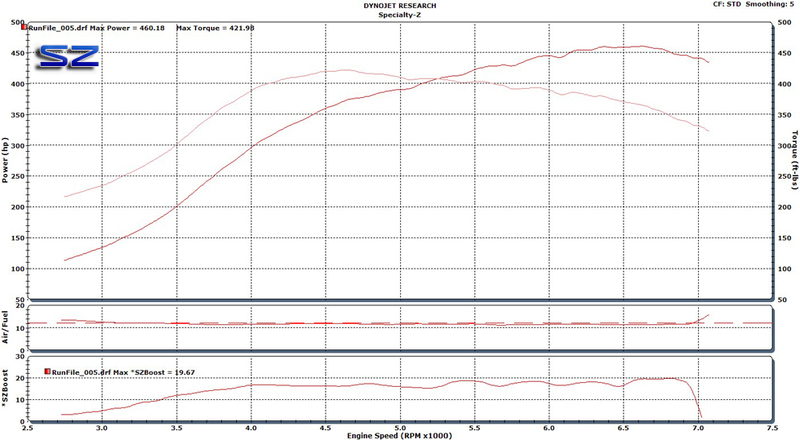 Your probably wondering why Jason’s truck baselined ALOT lower than Brians. Brian’s truck was not lifted and had factory sized tires. Jason on the other hand had his Titan lifted and equipped with massive monster truck tires. It took two of us to put his wheels back on. Not only are they heavier but he loses a ton of gearing too. This in turn hurts performance (f-ing duh!). WOT started after 3800+ RPMs so ignore it before then on the graph. Blue run is Jason’s baseline. Red is after we installed the D.T. 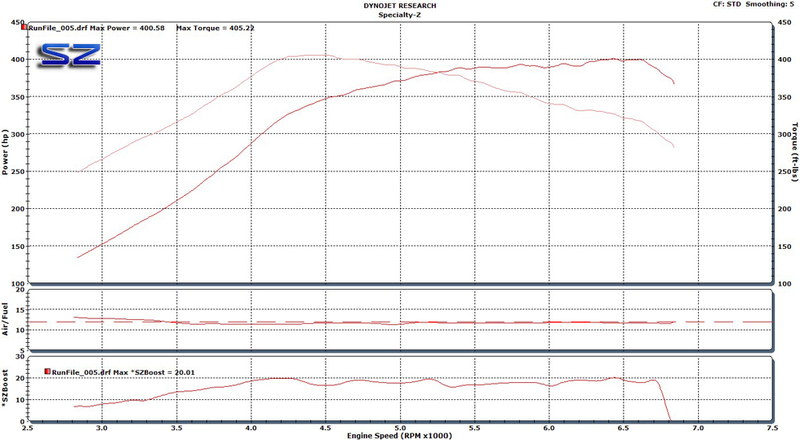 headers, Berk B-Pipes, and tune. 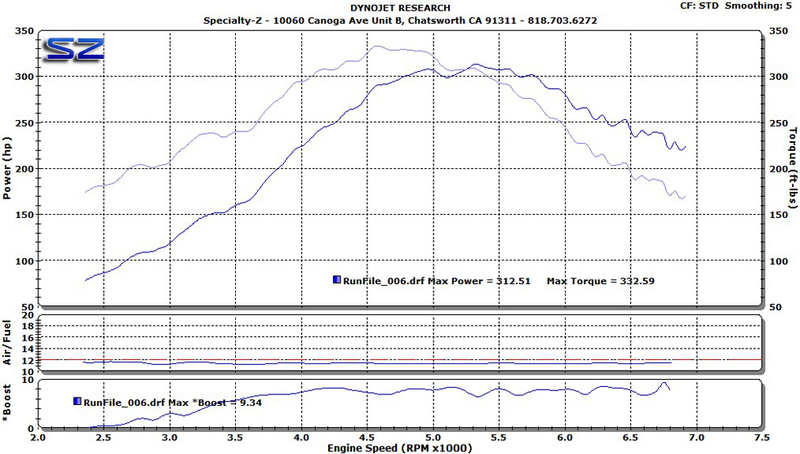 Peak power on Jason’s truck came up nicely. 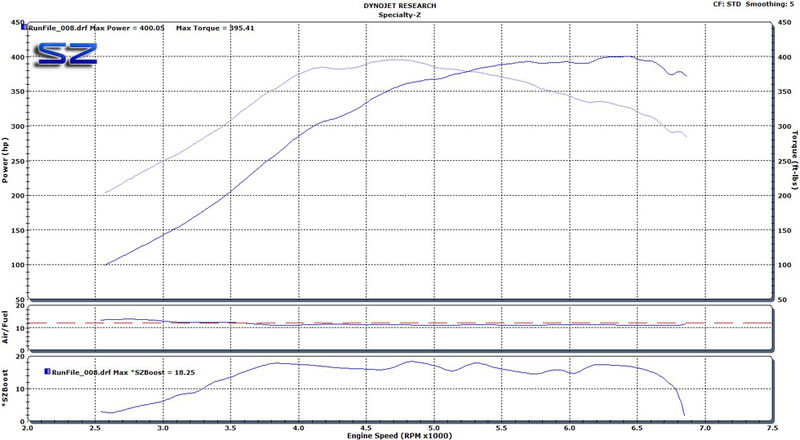 Looking at 5k you can see we gained 40 wheel torque and almost 40 whp. This truck would have easily made over 300+whp with the factory sized tires.